As part of a tailored exercise programme proprioceptive and balance exercises will be used to help you return to full function. Proprioception is the knowledge of where your body is in space. If you close your eyes and put your hand above your head you would have a good awareness of where your arm is. 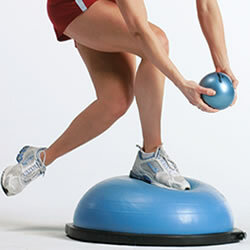 As a result of injury this sense is affected and has been shown to be reduced after injury. To help regain this we will give you a tailored programme that has videos, picture and instructions to guide you in your recovery. There will be no more wondering if you are doing your exercises correctly.